A tool used to cut sheet metal. There are various types of tin snips. Some cut only in straight lines while others are designed to cut curves and circles. Universal tin snips can do both. 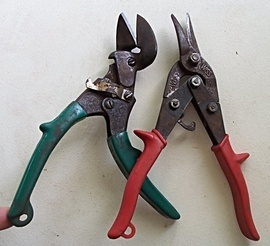 A good pair of tin snips generally runs $20 to $30.